You are here: Home » Going that extra mile. 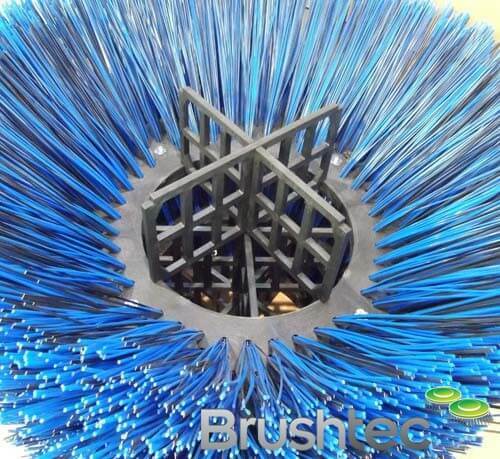 Shipping and storing large municipal side brushes can be a problem, they are bulky, difficult to handle and each unit can weigh up to 25kg. 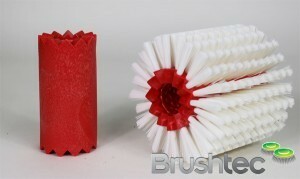 The majority of OEM’s house their brushes in the same way that they are delivered, on a pallet wrapped in vinyl shrink-wrap. They then remove the individual brushes as needed which is ideal when dealing with a fast turnaround of brushes but unfortunately, we do not live in an ideal world. Last winter for example, the majority of our customers could not sweep for several weeks due to the snow. 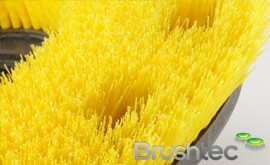 This meant surplus inventory on the shelves and pallets of brushes sat idle for up to three months. 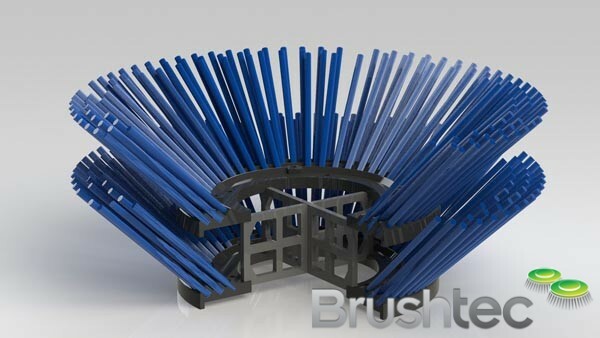 After this length of time and with nearly a quarter of a tonne pushing down on the bottom set of bristles, even our high quality brushes began to distort with the weight. 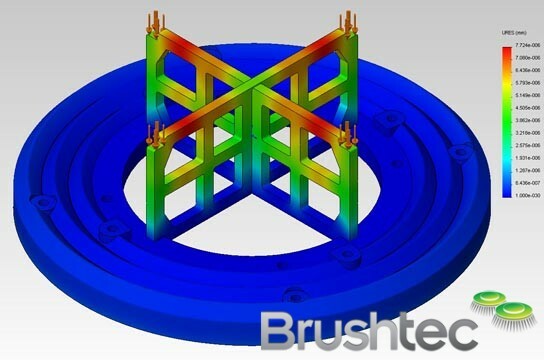 Here at Brushtec, we go that extra mile for our customers and in response to your feedback, we dedicated extensive time and resources developing our solution to support a stack of brushes. 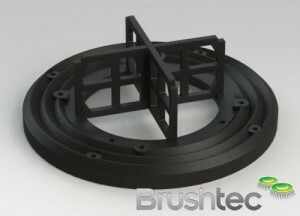 Using the latest in CAD,CAM and FEA* software, we designed and built the tooling for a high impact, interlocking frame to prevent the distortion of our brushes over time. 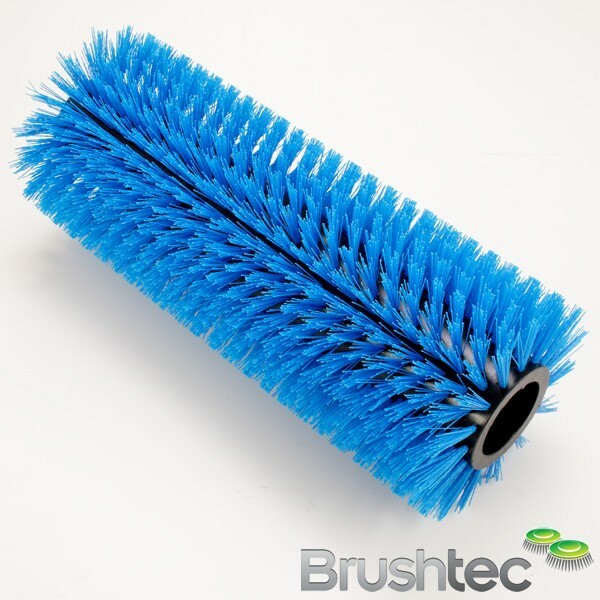 In line with our company values this product improves the quality of our services and ensures that when the brush is used, its performance is as good as the day it left our production line. The protection system can be implemented free of change on suitable palletised municipal side brushes. These spacers are manufactured from 100% post consumer recycled polypropylene and designed to be returned to us for re-use or recycling.